Because that’s just the way I roll, especially when it comes to knitting. The words ‘appropriateness’ and ‘seasonality’ do not exist in my knitting dictionary. I finished this stocking during the first week of January 2010, about two years after I had finished Walter’s matching one, and one year after I had re-committed to knitting this one. Small details, really :). Maybe the hiatus was good, as I had forgotten how much I love these fantastic kits from Judy’s Colors. 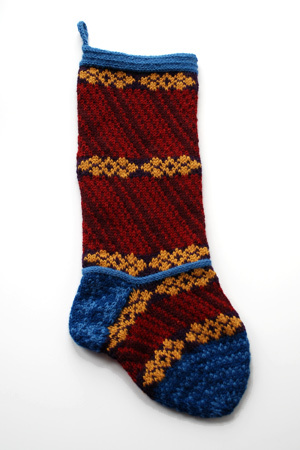 Pattern: Judy’s Colors St. Nick Christmas stocking kit. Favorite detail: all the applied i-cord! I especially loved the three rounds of i-cord at the top of the stocking, which I knit as a spiral. Least favorite detail: the shaped intarsia heel. Thank goodness for blocking. Also, every time the motif would change from spirals to golden flowers and back, there would be 4 yarn ends to weave in. Generally this would be a total bummer, except this is such a sticky wool, and weaving in more than an inch of yarn wasn’t necessary. My St. Nick, and his Red Velvet, side by side. Adorning the yarn cabinet, of course :). Eh, seasonally appropriate, whatever. 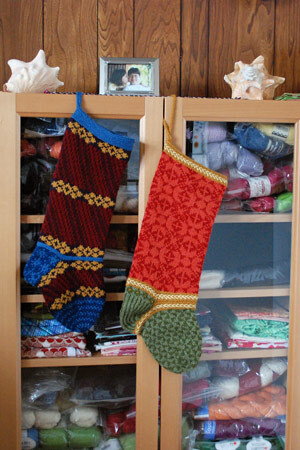 I think knitted stockings that beautiful should remain up all year! Oh I am almost never seasonally appropriate. I love these stockings! You’re right that all that i-cord is a great detail. I’m curious – do you knit all that i-cord or do you use one of those little machine gadgets I keep hearing about? I was looking at the pictures and kind of salivating over all the applied i-cord. Does that make me a knitting geek? I was inspired by your Red Velvet to start one of my own, over a year ago. I think I got through the cuff…. Maybe this summer….. Better late than never. I really like how the blue contrasts with the gold stars – a truly beautiful piece of knitting. You’re just really early for Christmas 2010. It looks so good! Gorgeous stockings! Just in time for Valentine’s Day! (start a new tradition) I am toying with the idea of replacing the skinny commercial stockings that the family has had starting in 1985 (one for each child and the parents) but am afraid that it may take as long as the baby blankets (the middle child didn’t get hers until she was 14). We will see. First I have to finish the hubby’s socks. Oh I LOVE them! That spiral i-cord is genius. It is such a pretty detail! You are ahead of the game for next Christmas! They are awesome. I love the colors. 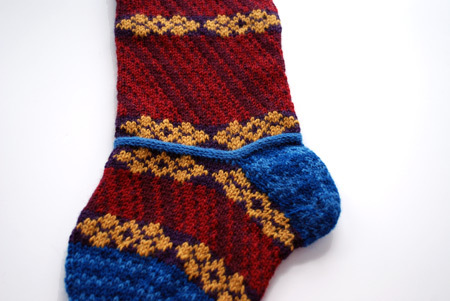 What a lovely project – I have to admit I’m looking at it for a sock pattern as well…hmmm…something for the idea file – thanks for sharing! This stocking looks great! 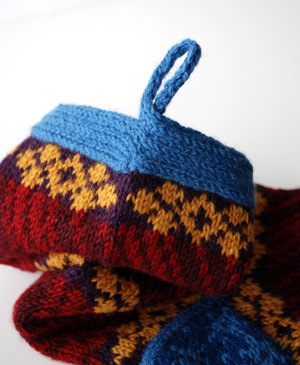 What made the intarsia shaped heel so onerous? Was it super fiddly? 3) He did not die shortly thereafter, Messiah – 1742, death – 1759. I must have him confused with Mozart who died shortly after composing (or while) Requiem. Remember the movie Amadeus? Those are fantastic, and timely is over-rated. I just re-found your blog at the beginning of the year (the first time was back when you had first designed Picovoli and I have a half knit version of my own that is still languishing in my yarn basket). I read the first few posts, and then went back and have methodically caught up on your knitting life over the life of this blog in the last 3 weeks. Reading it has been like reading an extremely well-written novel (complete with rich characters! ), and it has made laugh and cry as I related each post to its corresponding time in my life. Can I just say, I love your innate curiosity, and dedication to your crafts — I love that you break out the “maths”, graphing paper, scales, etc to really understand your knitting rather than blindly following someone else’s instructions. To me, the mark of a true craftsman. Brava, and please keep writing, knitting, and sharing! I have had those kits bookmarked since you first mentioned them, and I have yet to order them! So by the time I finally get around to making one, the idea will have been germinating for several years.